Future home of the White Garden! 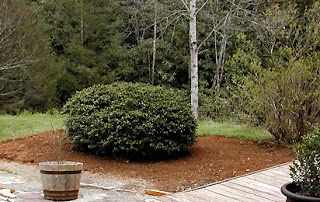 As we head into Spring, the White Garden project is moving along quite nicely. 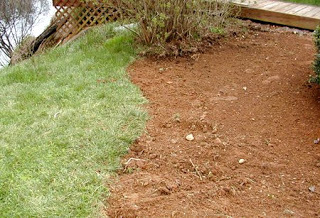 Dave and our friend, Hershel, recently cleared out the grass and mulched the area where the garden will be located, leaving Brigette with a blank slate (allowing her to do her favorite kind of garden planning — from scratch!). The mulch layer goes on! As we finalize the list of flowers, plants and shrubs that are going in the White Garden, there are a few that have already been given the thumbs up and have been ordered for planting in the Fall, including “Joan Senior” daylilies, and peonies with creative names like “Bowl of Cream” and “Festiva Maxima”. 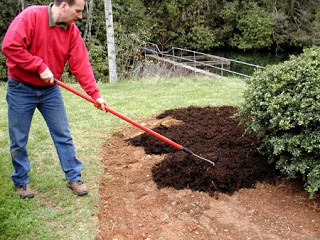 Other Fall plantings will include white daffodils, snow crocuses, hyacinths and snowdrops. 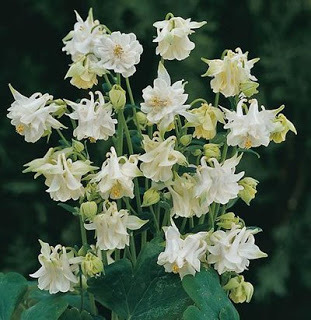 This week and next week, we’ll be watching for the delivery of white yarrow, white bellflowers, a white butterfly bush and a neat columbine we found called “Tower White” (pictured below). Those are all coming from one of our favorite nurseries, Bluestone Perennials, located in Ohio. Then, during the first week of May, we hope to visit some of our local nurseries and greenhouses to pick up several other plants that make it on to our final list. Stay tuned for photos over the next few weeks as we begin to plant the garden!